UK Racketlon Continues to Grow! Keith Lesser, the contagiously inspired Tournament Director of the English Open in Birmingham (new promising venue!) in October - and the coordinator of the emerging Racketlon Tour of the UK and Ireland reports from yet another UK Racketlon tournament - a doubles only tournament in Thurrock (an area by the Thames just east of Greater London). We seem to reach milestone after milestone (not uncommon right now in many countries). The 23rd April was no different, as the first ever doubles only racketlon event held in the UK took place at Bannatynes Health Club, Chafford Hundred, Thurrock. 28 entrants enjoyed a well run event, almost requiring no organization with administration kept to a minimum. Strong squash pairing Stuart Websdale and Mark Jackson combined to be victorious as the number one seeds rarely looked troubled. The winning formula proved to be composure and experience. These traits have been gained mainly from the 2005 World Tour and extensive racket backgrounds. Their most stern test came perhaps in the final, more about that later. On their way they defeated solid Veterans pairing Graham Norton & Dave Greatorex in a well spectated semi final. Of the 28 players that took part in this fun, fruity doubles event 10 players had never played in a racketlon event before. Of the 10 debutants, 6 were badminton specialists making all the badminton matches very strong indeed. The draw also contained Alistair Jones and Darren Kerins (fairly tasty). Jones queried whether representing England at badminton at senior level meant he could not qualify for Wales at the upcoming Racketlon World Championships. This statement sent quivers down most of the players' spines. Stanley, Taylor, Nicholson, Bridgeman, Terrell and Lampard thought their Essex League club exploits would stand them in good stead! Ping Pong Wizard Upsets the Draw! 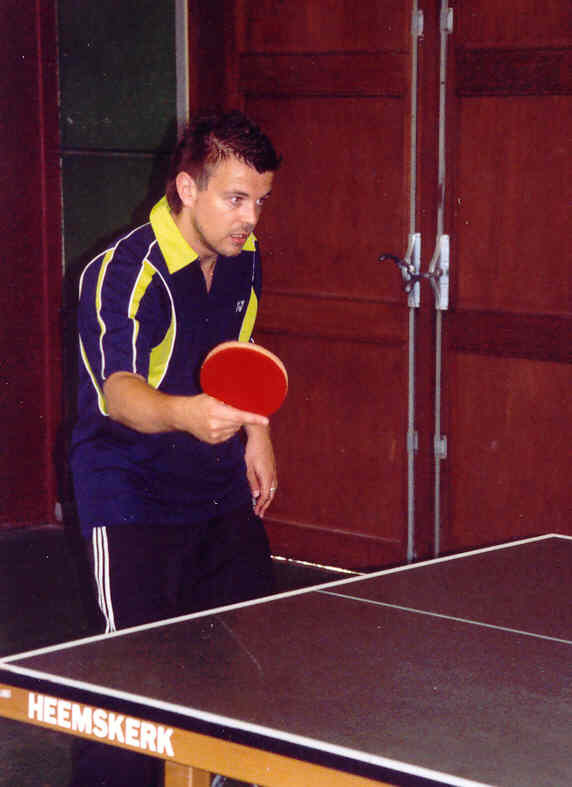 Currently ranked 36 in England at table tennis, Adrian Moore made his racketlon debut alongside his brother-in-law, squash and tennis expert Jeremy Bennett. Moore now takes the mantle as the highest ranked English table tennis player to participate in a racketlon event and is only surpassed in the UK by young Scot Gavin Rumgay. Gary Tendler, Michael Marsden, Joe Kennedy, Neil Charles, Lee Neil and Gergely Urban have all felt the wrath of Moore's backhand topspin in 05/06. What could he bring to the world of racketlon? Oblivious to his opposition, alongside Bennett they strode on against Kerins & Jones, the number two seeds and arguably the tournament favourites. A table tennis destruction left the badminton pair devastated. After returning the favour in sport two, the pairs matched up at squash. Bennett here showed his credentials as the strongest player and took a 2 point deficit into the tennis final. Bennett and Moore won the tennis 15-7 showing their true racketlon credentials. This sent them into the semis where they faced the winners of group three. 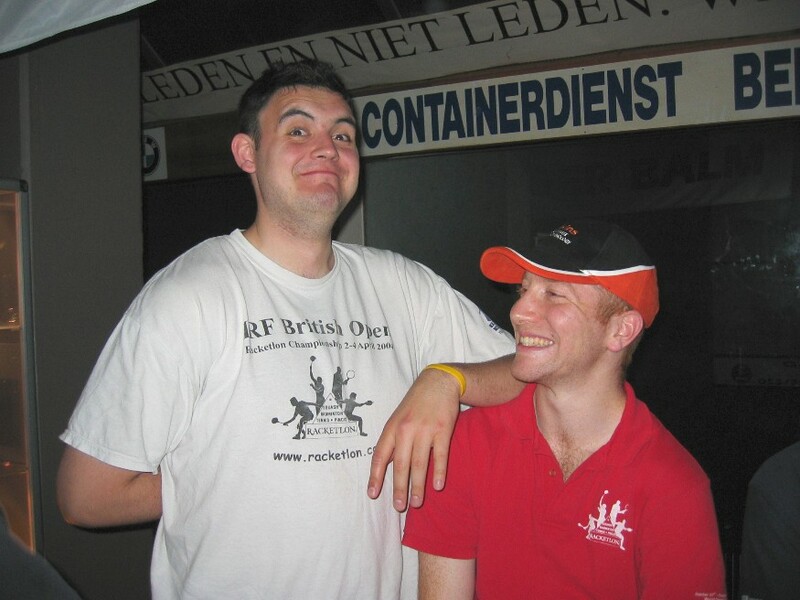 Having not played racketlon since June 2005 (at The Belgium Open), Nick looked to re-join the world of racketlon and that he did. The charismatic all-rounder showed some excellent skills almost stealing the championship, pushing Websdale and Jackson to the death. Nothing too sensational to report in the morning, two solid performances left little to do in the tennis. Macey's third match saw a slight scare against Matthew Lampard & Colin Jones. The badminton pair took a slight lead against the number three seeds leaving the tennis as the deciding factor. The tournament looked all but over with Nick's arm becoming more prosthetic by the minute and Lesser unable to move, complaining of sickness. Some gritty shots saw the gruesome, twosome make it through to the semis. Certainly the best table tennis of the day was seen when Bennett and Moore took on Macey and Lesser. Moore imposing his game was unable to dominate and it was Lesser's powerful forehand topspins that gave the number three seeds the advantage at the change of ends. The "Brothers in Law" turned it round and without some nifty Lesser cross table blocks, the match may have turned. As it was, 21-16 and on to the badminton. The match ended 21-16, 21-16, 21-9. Macey and Lesser were through to take on the much fancied World Championship Entrants Mark Jackson and Stuart Websdale. Just the Start They Needed! Both teams were content with 21-5, when considering the context of the match. 2-1 up, 5 didn't seem so much. However, the run of points towards the end of the match left both sets of players feeling a positive outcome. Macey fearlessly stating "5 or less!". 9 points in badminton was no mean feat, Macey carrying a tireless Lesser, no longer able to function mentally or physically, swiping shuttles as they came his way. The most entertaining rally of the day saw Lesser on the floor with Jackson and Websdale pummeling Macey for a further 20 or 30 strokes, Lesser then got up and re-joined the rally and inevitabely made the eventual mistake. With the less fancied pairing now 4 up going into squash, noone fancied the match to be decided in the tennis. However, Nick's 11-5 win over Stuart showed excellent technique, fitness and raw power. I hope some of the World Championship hopefuls sent Gert Peersman a 33rd Brithday Card yesterday (April 25th), I wouldn't want Nick anywhere near my part of the draw, on this kind of form. Squash coach Jackson left Lesser battered and numb moving the goalposts in their favour - 21-15. 2 up before the tennis! 21-17 to Stuart and Mark shows the closeness of the match. +6 - 17-16, very close indeed. Mark's flair and consistency was the deciding factor. Tennis is the talented Isle of Man player's 2nd sport. Demanding Customers make Improved Events! From studying the world renowned business model Michael Porter's 5 Forces, we can make some conclusions here about racketlon competition. Porter states in this model that the organization that will be the most successful will be the one with the most demanding customers. The organization then has to react to these customer needs and wants to stay competitive, otherwise these customers will not return for further business. Certainly, in my initial tournament experiences I am confident the British Tour will become the best on the planet, for certainly the Brits are the most demanding customers! A culture encompassing Faulty Towers, One Foot in the Grave and Blackadder leaves no future hope for my ginger locks (which have started to recede). The 3rd stop on the UK domestic tour is June 18th Hampshire - please enter via www.activeeurope.com . Ray Jordan, one of nine members of the IRF Council and article author Keith Lesser.